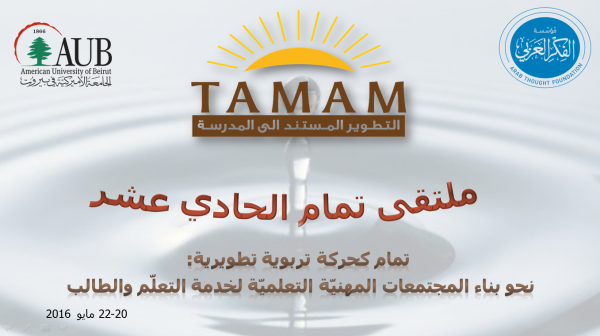 TAMAM is a collaborative school-based educational reform project involving schools in the Arab World. Unique in the region, it presents a new paradigm for school reform. 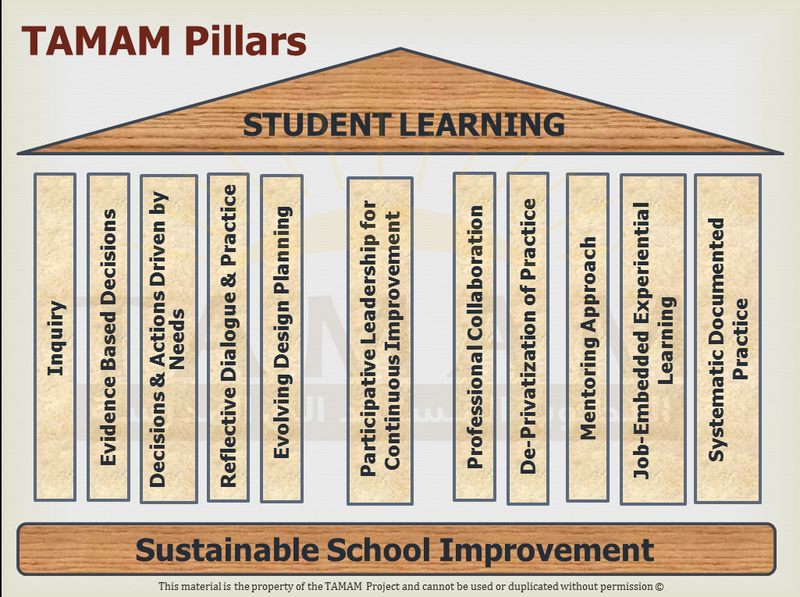 TAMAM is a project that combines research with development to bring about and support school based initiatives for sustainable school improvement. It aims to build a home-grown theoretical understanding of effective and sustainable school reform that improves students’ learning and is grounded in evidence and in the cultural context of the Arab region. Funded by the Arab Thought Foundation, TAMAM was launched in 2007 on the basis of a memorandum of understanding signed between the Foundation and the American University of Beirut. 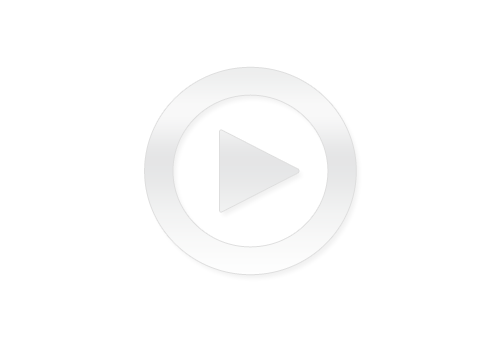 To get more information about TAMAM’ s Phases, Vision, and Mission. TAMAM’s name derives from its purpose: it consists of the initials of “ school-based reform” in Arabic (al-tatweer al-mustanid ila al-madrasa). 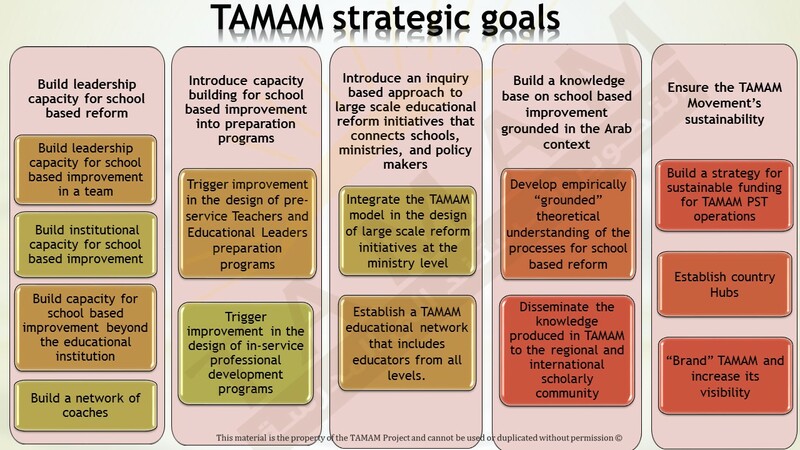 There are 5 Strategic Goals for TAMAM. The TAMAM Project Steering Team aims at building leadership capacity of lead teams for sustainable improvement through the TAMAM Journey, which consists of a series of stations that the lead team members pass through and learn from. The focus is to work on acquiring competencies related to the TAMAM Pillars which are research based principles for leadership and learning. The TAMAM journey is a design for a learning experience that the lead teams are invited to travel with the goal of acquiring a set of competencies to become leaders (self-directed) of their own learning and also of their mentors capable of transferring this learning to their educational institutions to transform them into professional learning organizations. This journey is designed in a way that provides lead teams with opportunities to learn and practice the competencies of the pillars, and modify their attitudes so that they develop new habits of mind necessary for initiating change. Traveling the TAMAM journey, is guided by a set of templates. These templates are a set of guiding formal structures developed by the project steering team (PST). 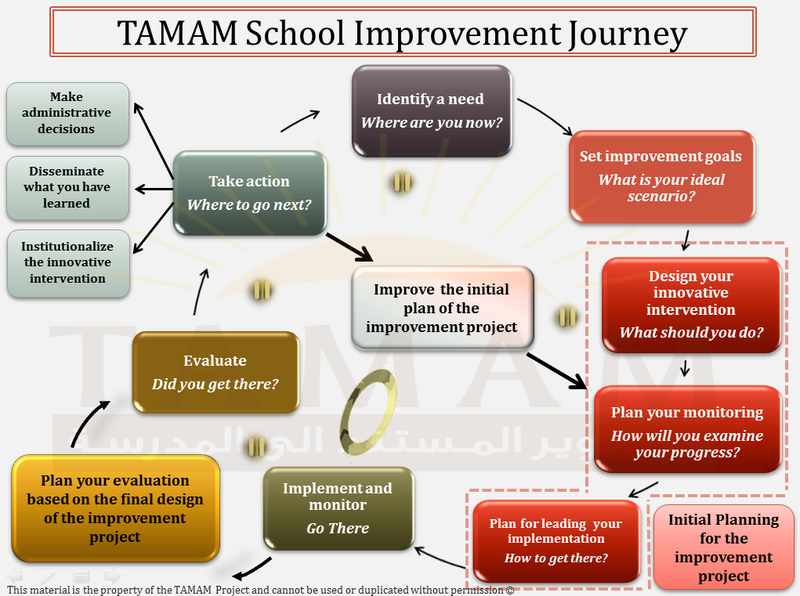 They are comprised of guiding points for lead team members travelling the TAMAM school improvement journey to reflect on and document the experience they are going through. The Project Steering Team and TAMAM coaches work with lead teams to help them develop professionally and reach their potential. In parallel, they design research studies to understand and gain deeper knowledge of the processes taking place for development. Research in TAMAM is inspired by the team members’ learning and on-going reflective inquiries. It is a “live research project” (Craig, 2010) and its PST plays a dual role: that of coaches, for individual, team, and organizational development and that of researchers. The TAMAM Project Team of experts consists of The Project Steering Team and a Group of Consultants for the participating countries. Testimonials about TAMAM at AUB.